I love playing the asylum challenge, but the current rules are bit too sims 2-ish for my taste, so I made my own version of it. I am still relying on the concept from the original challenge. You have been committed against your will to a mental institution. You are living among crazy people and you are clearly not crazy, at least not that crazy. To prove that you are a highly functional member of society and quite sane you are trying against all odds to achieve your life time goal. Once you have achieved your lifetime goal your psychiatrist has promised to release you from the asylum. The mental institution you have been committed to is underfunded and overpopulated, so you might find it a bit challenging to make your everyday life work. You start by creating 8 sims, one of them is the sim that you will be playing. If your computer can’t handle large households, go with 6 instead. 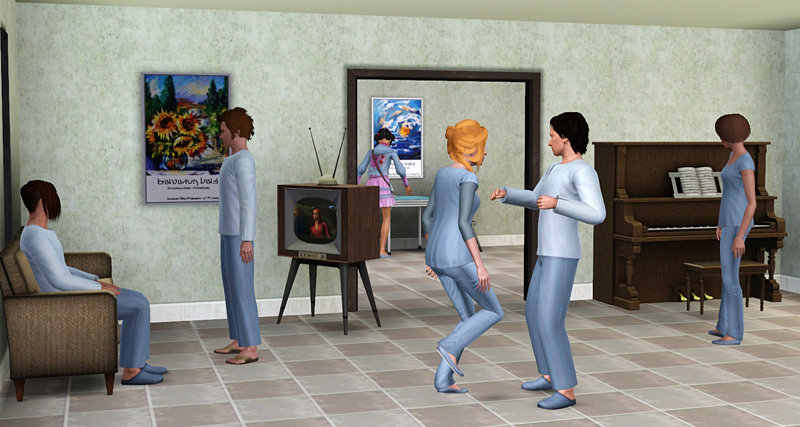 The sims should all be adults or young adults. They can look how-ever you like. You can randomize everyone’s personality including your own sims’ (using the in game tool) if any of the non-allowed traits shows up (shown below), you remove it and pick a different one. You have to replace at least one trait from the Must have trait list below. If you want you can also add traits from the Spice things up List. The profession lifetime wishes: Fashion phenomenon, fire fighter super hero, home design hotshot, Paranormal profiteer, Pervasive private eye, Seaside Savior. The professions require you to constantly dart around the world and visit people’s homes sometimes with weapons. The city council will not allow currently admitted persons to register for a profession. The same goes for the performer life time wishes: Master acrobat, Master magician, Vocal Legend. The city council do not allow insane performers in their city – sorry. Gold Digger: The wish requires you to marry outside your household which isn’t allowed. Great Explorer: Due to your status as insane you are on the no-flight list. Martial Arts Master: Unless you jump though a lot of hoops, you need to visit China to do this lifetime wish and you are still on a no-flight list – so no. Monster Maker & More than a Machine: There is no room in the household for extra sims, which is required for this lifetime wish. Private Museum: Due to your no-flight status you cannot for fill this wish. Seasoned Traveller: Due to your no-flight status you cannot for fill this wish. Surrounded by Family: You are on anti-contraception drugs while in the asylum so sorry you cannot have five kids. The Fairy Tale Finder: Finding a unicorn will not disprove you are crazy + you cannot leave the lot to hunt it down. Emperor of evil: Really you want to become the emperor of evil, I think we got you right where we want you. Become an astronaut: The military screens people before letting them into tin cans for three months in space, sorry. Become a master thief: Not exactly a way to show that you are a productive member of society. International super spy: You are on a no-flight list and they tend to screen people for this kind of gig. Possession is nine tenths of the law: Really you want to show that you are sane by compulsively steel random stuff? World Class Gallery: Due to your no-flight status you cannot for fill this wish. Celebrity Psychic: Not exactly a way to show that you are a productive member of society. Deep Sea Diver: Now that doesn’t seem safe, now does it, with you being unstable and all. No, you can not get a diving certificate, so this is not a suitable lifetime wishe. Grand Explorer: As this lifetime wish can only be completed in specific neighbourhoods it seems like a stupid wish to take. And it requires way to much darting about in the world. No, sorry, no. Made the Most of My Time: Time travel you say, I thought you were getting better. Major Master & Perfect Student: You are not allowed to leave town, so sorry you can not attend university as long as you are committed here. Resort Empire: You owning a business, that does not seem like a good idea. Sorry we can not allow you to make that sort of purchase. You are not allowed to work in any of the following career types: Performers and professions. You may build your asylum in any way you want as long as you follow the rules below. Put a fence around the building and lock the gate so that it is only your sim that may exit the lot. You are allowed as many bookcases, stereos and mirrors as you want. Objects that only build hidden skills or just provide fun are allowed once the challenge starts, but you have to earn the money for them. But you may not have them from the start. The rules above may not be broken once you start playing. So if you from the start are limited to 1 fridge you may in no point in the challenge have more than one fridge, but you may replace or upgrade the fridge. When you are done building reduce the family funds to 100§ everything you need later has to be brought for your sims’ earnings. Be aware that the limitations on what objects you can have (listed above) still apply though-out the challenge. When the challenge start, you only control your own sim, all other sims have to be allowed to roam around the house doing what they want to do. Military: operating heavy machinery, firearms and million simlion equipment… well that’s not jobs for the insane. Upgrading the stove so it is flame proof: How else will your sims catch on fire? 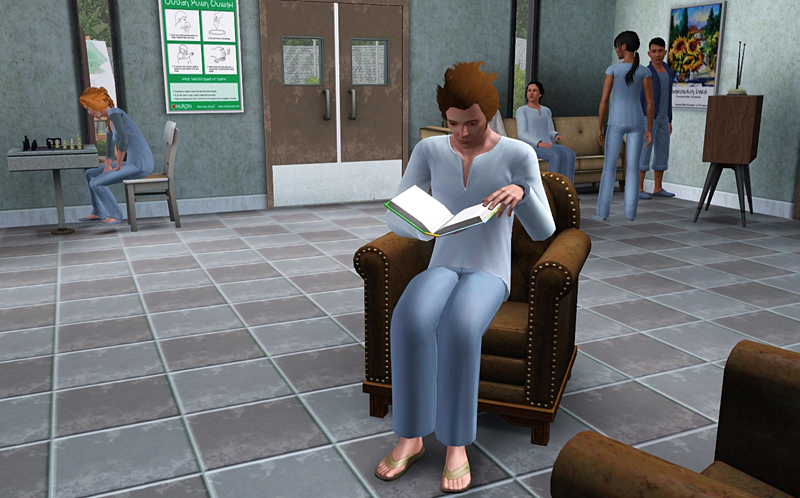 Your sim may not sleep in the same bed two nights in a row – if that bed is the only one available, you may sleep there, but try not to. You are not allowed to have any children. If you have a hack that makes it possible to insure this, use it. If you should somehow get a child though no-fault of your own, you have to get rid of the child. Skill building items may not live in your sim’ inventory. If the objects disappears into other sims’ inventory you are allowed to remove them once a day and place them in a place where everyone can get to them. You are not allowed to place items so only your sim can get to them. No maid, no repair person, no butler. No cheats after you start playing. Resetting the lot or sims if people get stuck due to bugs or other things that are clearly bugs happen. You are allowed to use magic and potions of all sorts. Only your sim is allowed to take opportunities. But remember that you are not allowed to visit lots that isn’t on the list of lots you may visit. If you have the money for it, you are of course allowed to re-buy things that was destroyed in fires. If your sim dies then you lose the challenge. If any other sim dies on the lot (visitors or patients) you must leave their urn/tombstone on the lot. You also have to get rid of one bed-spot per death. Congratulations your asylum is now haunted. You win the challenge once you have for filled your life time wish. You are now fit to rejoin the rest of society and live outside the institution. Locking and trying to for fill any mid-life crisis wish your sim might get, as long as they are within the rules of course. Having washer on the lot, so the sims have to do laundry. If you want to use hacks, then it is your game so go ahead. If you think a hack feels like cheating, do not use it. Well this looks interesting, I was thinking this there is an excellent type of lot for this ready build in Lucky Palms, in the side of town that is rather downtrodden and down market.